Author: Andrew Moore, Published in November 2017, AVAILABLE NOW. Aintree Down Under - Warwick Farm and the Golden Age of Australian Motor Sport - Limited edition of 120 copies numbered and individually signed. This deluxe edition is bound with green Buckram cloth covering boards, gold foil lettering on the spine and dust wrappers that feature front and back cover illustrations. I've travelled the motor racing world for over 40 years but nothing — nothing — compares with how it was at Warwick Farm in the 1960s and 1970s. The cars, the drivers, the circuit, the paddock ... all of them, for me, defined motor racing in its purest form. Andrew Moore's book brings this greatest of Golden Eras back to life and colour. I'll treasure it always (Peter Windsor, award-winning motor racing journalist and former F1 team manager). 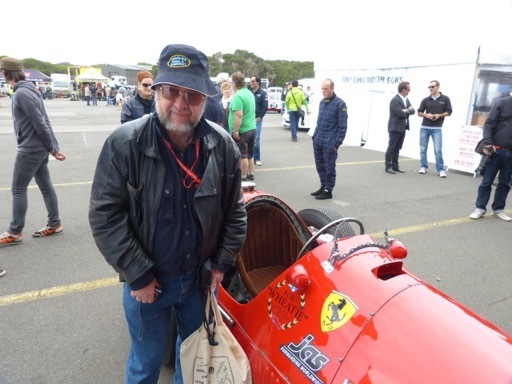 Aintree Down Under is a compelling account of a time in motor sport when Kings walked on our earth and we were all part of the court of Camelot … Warwick Farm was a magical place full of fun and fantasy (John Smailes, motoring journalist and author). There's no question Andrew Moore is one of the most authoritative historians on the golden era of Australian motor racing but it’s his passion and excitement in Aintree Down Under that makes this book such a cracking read … (Warren Brown, former host Top Gear Australia). Between 1960 and 1973, Warwick Farm was Australia’s motor racing mecca, its holy of holies, its sinuous 3.6 km track hosting some of the best motor racing Australia has ever seen before or since. Formula 1 stars like Stirling Moss, Jim Clark, Jackie Stewart, Jack Brabham and Jochen Rindt excelled there, while local drivers like Frank Matich and Leo Geoghegan matched them wheel-to-wheel. ‘The Fabulous Farm’ changed the landscape of Australian motor racing. Aintree Down Under is the first book on Warwick Farm’s motor racing and its contribution to motor sport. Using hitherto untapped sources, including those of the brilliant Englishman Geoff Sykes who ran it, this work tells the story of how Warwick Farm began and evolved into Australia’s most revered motor-racing track. From the glorious Tasman series for open-wheelers to increasingly muscular touring cars with drivers like Norm Beechey, Pete Geoghegan and Bob Jane pedal to the metal, the Farm had it all. Finally, this history delves into the murky, behind-the-scenes intrigues that brought about the Farm’s sad demise in 1973. More than just a sports book, Aintree Down Under provides a snapshot of Sydney’s social and cultural history in the ‘Swinging Sixties’ and pays tribute to the full-time staff and volunteers who ran the Farm. It is also a study of nostalgia and memory, as the Farm influenced many people to become motor-racing enthusiasts for life. The book documents a golden era of Australian motor racing when the love of the sport was more paramount than mere money-making. Andrew Moore is an adjunct associate professor at Western Sydney University where he taught Australian history for 30 years. In his youth, he was a flag marshal and official at Warwick Farm, as well as a singularly unsuccessful rally driver. Aintree Down Under is his sixth book. He has written articles for the Australian Dictionary of Biography on motoring luminaries such as Evan Green, Jack Murray, Ken Tubman, Mary Packard and Ray Revell. A member of the Historic Sports and Racing Car Association and Renault Car Club, Andrew drives a Renault RS 265 Megane. He lives in Sydney and Taralga, NSW. A very interesting and well constructed book..
For those of us who attended Warwick Farm from Day 1, this is a truly Excellent book. Warwick Farm operated during the Golden Years of Australian Motor Sport, hosting many Tasman Cup races, Improved Production touring car races, and sports car races. Andrew Moore encapsulates the history of this great race track. A great read, I mourned the loss of Warwick Farm as a venue & this book allowed me to relive some of my youth & enlightened me to some of the factors that gave rise to the track & ultimately to it's demise. still only about half way through but a good read so far. For those of us who were there in the day, some interesting hitherto unknown items about its establishmnet and the politics thereof. Great book, as I expected, maybe some more pics., but all is fine. Doug.